The reaction turbine is an example of pressure compounding turbine. 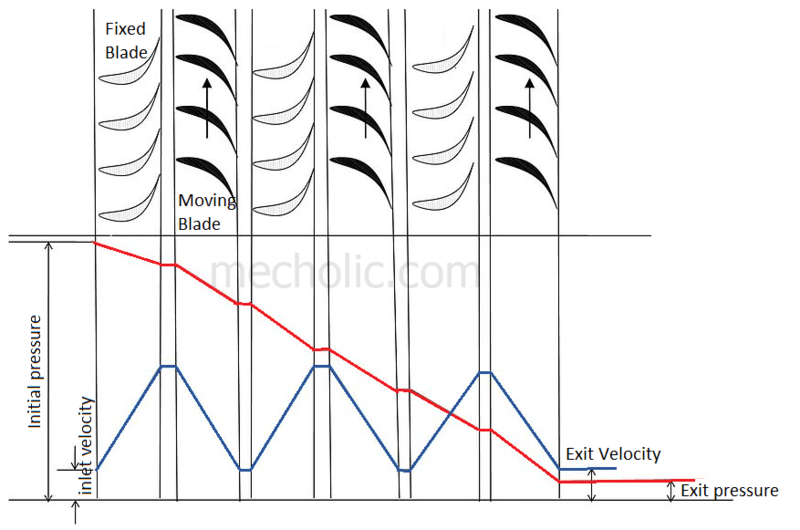 In these type of turbine the pressure drop occurs gradually, and continuously over moving blades and fixed blades. The figure shows the diagram of the arrangement of fixed blades and moving blades. The steam from boiler pass over the moving blades and impart a rotational work on it. 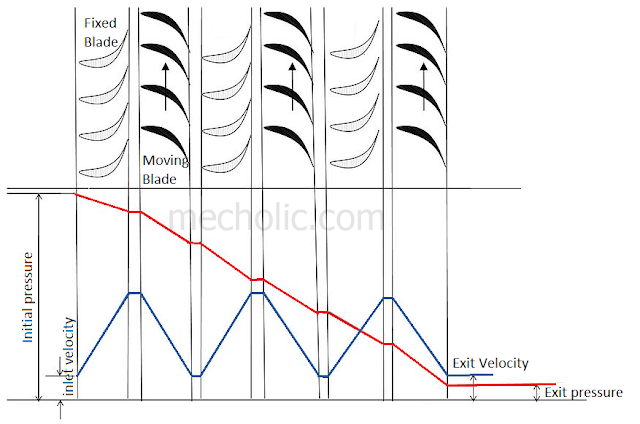 During steam pass over moving blades, the kinetic energy absorbed and pressure drop as well as velocity drop occurs. The function of fixed blades is similar to the nozzle, they used to direct stem to the moving blades. While steam pass over the fixed blades, the pressure partially drops and velocity of steam increases as per Bernoulli’s equation. 🔗What is meant by compounding Of turbine? The change in velocity and pressure is shown in above figure. Here the pressure energy is absorbed by the moving blades in multiple stages, this is known as pressure compounding. The volume of steam increases as pressure drops, therefore the diameter of turbine wheel must increase after every stage. Steam at high temperature and pressure can be used reaction turbine. It has high blade efficiency. Both pressure energy and kinetic energy are available (to do work) at inlet of blades. It takes more space per unit power generated. The casing should be airtight.